The Samsung Juke (SCH-U470) is the latest mobile phone from Samsung which they are marketing to be a music player first and THEN a mobile phone—seems that way from their press release. The Samsung Juke is a 2GB music player with an innovative design, just flick your thumb and the SCH-U470's display swivels to reveal the phone pad. I must admit, Samsung has been churning out mobile phones that shy away from candy bar designs that Nokia is always offering, which is a good thing. 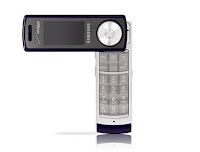 The Samsung Juke is another innovative design from Samsung, something that follows in the step of the B'Phone. The Samsung Juke (SCH-U470) has all the necessary S's...Sleek, Slim, Stylish, and...Swivels. The Samsung Juke supports .mp3, .wma, .aac and .aac+ music file formats. The downside of the Samsung SCH-U470 is probably its lack of a high mega pixel camera. The Samsung Juke's camera is only 1.3 mega pixels and the display size is a mere 1 inch, not really great for viewing videos or photos. The Samsung Juke will be available in three colors, red, teal and navy blue. The Samsung Juke (SCH-U470) will be available in Verizon Wireless stores for $99.99 after a $50 mail-in rebate.